I could have been in the street borrowing money, snatching women's bags or sniffing glue but now I know how to take pictures, how to process film and about the Internet. ‘Ndolo’ means ‘muddy day’, that means I was born on a muddy day. I am thirteen years old, black and fashionable. I am a goalkeeper. I finished my primary education in 1997. My mother said she doesn’t have money, so no school now. 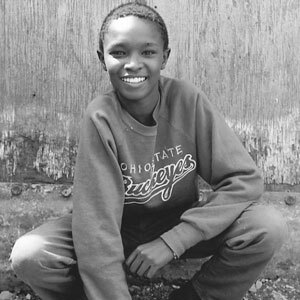 I live with my mother and four brothers and three sisters in a cubic room in Huruma, in a place called Ngei. I thank God and Shootback because I could have been in the street borrowing money, snatching women’s bags or sniffing glue but now I know how to take pictures, how to process film and about the Internet. When I get money I can continue to learn and go to secondary school. And when home is boring, I go to my friends like Mathenge and Julius and then we go to search for better pictures and I call it a day.